RVX: The RV Experience, North America’s new and biggest RV show, is being celebrated as a huge success. AboutcampBtoB was there and will be publishing a full report, plus interviews with senior management, in its next issue (no. 23). OEMs, suppliers, dealers, retailers and campgrounds showcased the latest RV products and celebrate the RV lifestyle cherished by millions of Americans. Attendees from all over the world enjoyed over 500,000 square feet of exhibition space, featuring over 300 RVs, outdoor and camping products, and more. During RVX, Go RVing launched an unprecedented multi-million-dollar national media campaign to “Kick Off Camping Season” by bringing in over 200 members of the media to cover the industry and new products being unveiled. The campaign, which will run throughout the spring and summer months, will build consumer awareness throughout the high season and drive new customers to RV dealer partners across the country. Over 2,200 attendees packed into the standing room only “Reveal”, an entertaining and engaging opening session, highlighting how new products meet the needs of key consumer segments such as outdoor adventurers, families, tailgaters and spare-no-expense travelers. Throughout the event, attendees experienced packed education sessions about these emerging consumer trends and how the industry can attract millions of new customers to the RV lifestyle and convert them into sales. 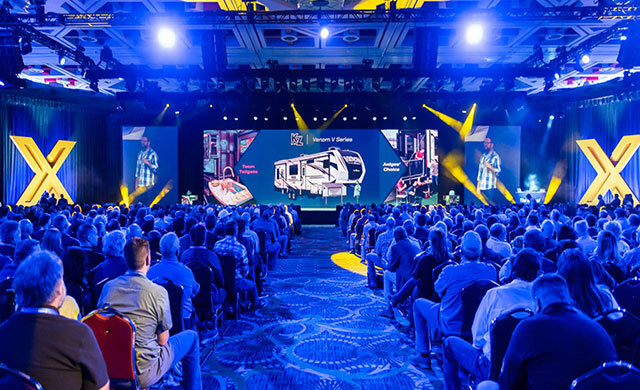 “From the intermingling of units and supplier booths, to the inclusion of industry influencers and additional media outlets to reach the end consumer, to the push for innovation throughout, RVX was a great experience for Dometic,” said Vice President of Marketing for Dometic Trey Miller. “This show forced many companies to get out of their comfort zones and take stock of their marketing, sales, and product development efforts. RVX is not the Louisville show of old. This is where B2B shows are heading in all leading markets and the RV industry is now on or in several respects ahead of the pace,” continued Trey Miller. “RVX was an exciting and fresh expo that brought great attention to our industry and should bring a new group of clientele to our stores,” said Mike Pearo of Hilltop Camper. The second RVX: The RV Experience is scheduled for March 10-12, 2020 at the Henry B. Gonzalez Convention Center in San Antonio, TX. For more information and to sign up for updates visit RVX.org or follow the RV Industry Association on Facebook, Twitter and Instagram.